Images depicting the elbow joint can be seen below. The coronoid acts as the anterior buttress of the greater sigmoid notch of the ulna. It provides attachment to the anterior band of the medial collateral ligament (MCL) and the middle portion of the anterior capsule. The anterior colliculus of the MCL is the primary stabilizer of the elbow against valgus strain in the functional arc of 20-120° of flexion. This ligament is most likely to become injured with a low coronoid fracture with the elbow in full extension. A fracture of the coronoid, therefore, results in the loss of all of these supports. The brachialis muscle is attached to the base of the coronoid process. Dissection of the brachialis during fixation of these fractures contributes to the risk of heterotopic ossification in these cases. Closkey et al studied the stabilizing function of the coronoid process under axial load to the elbow. They found no significant difference, at any flexion position, in posterior axial displacement between intact elbows and elbows in which 50% or less of the coronoid process was fractured (types 1 and 2; see Workup). Differences in posterior axial displacement were significant, across all flexion positions, between intact elbows and elbows in which more than 50% of the coronoid process was fractured (type 3). Coronoid fractures were believed to result from avulsion of a bony fragment of the coronoid by the brachialis, which inserts onto the coronoid process. This, however, does not explain the mechanism of type 1 and some type 2 fractures, as the brachialis attaches to the base of the coronoid process of the ulna. (See Workup, Imaging Studies, for a discussion of fracture types.) These fractures probably occur from shear forces at the time of the dislocation when the trochlea pushes off a piece of the coronoid. Coronoid fractures account for fewer than 1-2% of all elbow fractures. They have been identified in 10-15% of elbow dislocations. [14, 15] Radial head fractures are seen in about 5-10% of elbow dislocations. Coronoid fractures, especially with large fragments, are associated with more instability and an increased incidence of complications. Josefsson PO, Gentz CF, Johnell O, Wendeberg B. Dislocations of the elbow and intraarticular fractures. Clin Orthop. 1989 Sep. (246):126-30. [Medline]. Ring D, Horst TA. Coronoid Fractures. J Orthop Trauma. 2015 Oct. 29 (10):437-40. [Medline]. Kovacevic D, Vogel LA, Levine WN. Complex Elbow Instability: Radial Head and Coronoid. Hand Clin. 2015 Nov. 31 (4):547-56. [Medline]. Ring D, Jupiter JB. Fracture-dislocation of the elbow. Hand Clin. 2002 Feb. 18(1):55-63. [Medline]. Ring D, Jupiter JB, Zilberfarb J. Posterior dislocation of the elbow with fractures of the radial head and coronoid. J Bone Joint Surg Am. 2002 Apr. 84-A(4):547-51. [Medline]. Ring D. Fractures of the coronoid process of the ulna. J Hand Surg [Am]. 2006 Dec. 31(10):1679-89. [Medline]. Wells J, Ablove RH. Coronoid fractures of the elbow. Clin Med Res. 2008 May. 6(1):40-4. [Medline]. [Full Text]. Steinmann SP. Coronoid process fracture. J Am Acad Orthop Surg. 2008 Sep. 16(9):519-29. [Medline]. Mathew PK, Athwal GS, King GJ. Terrible triad injury of the elbow: current concepts. J Am Acad Orthop Surg. 2009 Mar. 17(3):137-51. [Medline]. Forthman C, Henket M, Ring DC. Elbow dislocation with intra-articular fracture: the results of operative treatment without repair of the medial collateral ligament. J Hand Surg [Am]. 2007 Oct. 32(8):1200-9. [Medline]. Cage DJ, Abrams RA, Callahan JJ, Botte MJ. Soft tissue attachments of the ulnar coronoid process. An anatomic study with radiographic correlation. Clin Orthop. 1995 Nov. (320):154-8. [Medline]. Morrey BF. Complex instability of the elbow. Instr Course Lect. 1998. 47:157-64. [Medline]. Closkey RF, Goode JR, Kirschenbaum D, Cody RP. 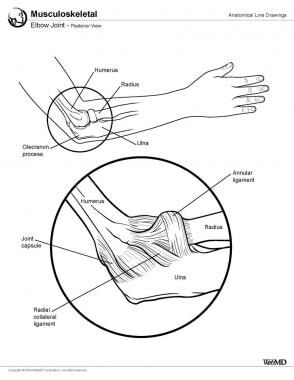 The role of the coronoid process in elbow stability. A biomechanical analysis of axial loading. J Bone Joint Surg Am. 2000 Dec. 82-A(12):1749-53. [Medline]. Regan W, Morrey B. Fractures of the coronoid process of the ulna. J Bone Joint Surg Am. 1989 Oct. 71(9):1348-54. [Medline]. Selesnick FH, Dolitsky B, Haskell SS. Fracture of the coronoid process requiring open reduction with internal fixation. A case report. J Bone Joint Surg Am. 1984 Oct. 66(8):1304-6. [Medline]. Linscheid RL, O'Driscoll SW. Elbow dislocations. Morrey BF, ed. 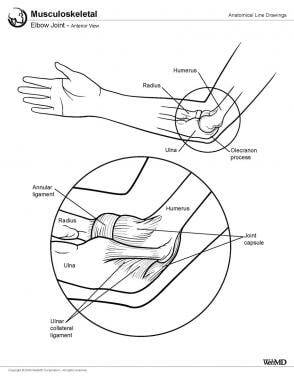 The Elbow and Its Disorders. 2nd ed. Philadelphia: WB Saunders; 1993. 441-52. Egol KA, Immerman I, Paksima N, Tejwani N, Koval KJ. Fracture-dislocation of the elbow functional outcome following treatment with a standardized protocol. Bull NYU Hosp Jt Dis. 2007. 65(4):263-70. [Medline]. Kälicke T, Muhr G, Frangen TM. Dislocation of the elbow with fractures of the coronoid process and radial head. Arch Orthop Trauma Surg. 2007 Dec. 127(10):925-31. [Medline]. Adams JE, Hoskin TL, Morrey BF, Steinmann SP. Management and outcome of 103 acute fractures of the coronoid process of the ulna. J Bone Joint Surg Br. 2009 May. 91(5):632-5. [Medline]. Rodriguez-Martin J, Pretell-Mazzini J, Andres-Esteban EM, Larrainzar-Garijo R. Outcomes after terrible triads of the elbow treated with the current surgical protocols. A review. Int Orthop. 2011 Jun. 35 (6):851-60. [Medline]. Lill H, Korner J, Rose T, et al. Fracture-dislocations of the elbow joint--strategy for treatment and results. Arch Orthop Trauma Surg. 2001. 121(1-2):31-7. [Medline]. Broberg MA, Morrey BF. Results of treatment of fracture-dislocations of the elbow. Clin Orthop. 1987 Mar. (216):109-19. [Medline]. Bracq H. Fracture of the coronoid apophysis. Rev Chir Orthop Reparatrice Appar Mot. 1987. 73(6):472-3. [Medline]. Blasier RD. Intra-articular flap fracture of the olecranon in a child. A case report. J Bone Joint Surg Am. 1989 Jul. 71(6):945-7. [Medline]. Greenspan A, Norman A, Rosen H. Radial head-capitellum view in elbow trauma: clinical application and radiographic-anatomic correlation. AJR Am J Roentgenol. 1984 Aug. 143(2):355-9. [Medline]. Greenspan A, Norman A. Radial head-capitellum view: an expanded imaging approach to elbow injury. Radiology. 1987 Jul. 164(1):272-4. [Medline]. Guitton TG, van der Werf HJ, Ring D. Quantitative measurements of the volume and surface area of the radial head. J Hand Surg Am. 2010 Mar. 35(3):457-63. [Medline]. Lindenhovius A, Karanicolas PJ, Bhandari M, van Dijk N, Ring D. Interobserver reliability of coronoid fracture classification: two-dimensional versus three-dimensional computed tomography. J Hand Surg Am. 2009 Nov. 34(9):1640-6. [Medline]. Rhyou IH, Lee JH, Kim KC, Ahn KB, Moon SC, Kim HJ, et al. What Injury Mechanism and Patterns of Ligament Status Are Associated With Isolated Coronoid, Isolated Radial Head, and Combined Fractures?. Clin Orthop Relat Res. 2017 Sep. 475 (9):2308-2315. [Medline]. Kaas L, Turkenburg JL, van Riet RP, Vroemen JP, Eygendaal D. Magnetic resonance imaging findings in 46 elbows with a radial head fracture. Acta Orthop. 2010 Jun. 81(3):373-6. [Medline]. Papatheodorou LK, Rubright JH, Heim KA, Weiser RW, Sotereanos DG. Terrible triad injuries of the elbow: does the coronoid always need to be fixed?. Clin Orthop Relat Res. 2014 Jul. 472 (7):2084-91. [Medline]. [Full Text]. Chan K, MacDermid JC, Faber KJ, King GJ, Athwal GS. Can we treat select terrible triad injuries nonoperatively?. Clin Orthop Relat Res. 2014 Jul. 472 (7):2092-9. [Medline]. [Full Text]. Watters TS, Garrigues GE, Ring D, Ruch DS. Fixation versus replacement of radial head in terrible triad: is there a difference in elbow stability and prognosis?. Clin Orthop Relat Res. 2014 Jul. 472 (7):2128-35. [Medline]. [Full Text]. Giannicola G, Sacchetti FM, Greco A, Cinotti G, Postacchini F. Management of complex elbow instability. Musculoskelet Surg. 2010 May. 94 Suppl 1:S25-36. [Medline]. Kiene J, Wäldchen J, Paech A, Jürgens Ch, Schulz AP. Midterm Results of 58 Fractures of the Coronoid Process of the Ulna and their Concomitant Injuries. Open Orthop J. 2013. 7:86-93. [Medline]. [Full Text]. Hanks GA, Kottmeier SA. Isolated fracture of the coronoid process of the ulna: a case report and review of the literature. J Orthop Trauma. 1990. 4(2):193-6. [Medline]. Sotereanos DG, Darlis NA, Wright TW, Goitz RJ, King GJ. Unstable fracture-dislocations of the elbow. Instr Course Lect. 2007. 56:369-76. [Medline]. Pai V, Pai V. Use of suture anchors for coronoid fractures in the terrible triad of the elbow. J Orthop Surg (Hong Kong). 2009 Apr. 17(1):31-5. [Medline]. Clarke SE, Lee SY, Raphael JR. Coronoid fixation using suture anchors. Hand (N Y). 2009 Jun. 4(2):156-60. [Medline]. [Full Text]. Garrigues GE, Wray WH, Lindenhovius AL, Ring DC, Ruch DS. Fixation of the coronoid process in elbow fracture-dislocations. J Bone Joint Surg Am. 2011 Oct 19. 93(20):1873-81. [Medline]. Giannicola G, Polimanti D, Gumina S, Cinotti G. Use of Fine-threaded K-wires in the Treatment of Coronoid Fractures in Complex Elbow Instability. Orthopedics. 2013 Oct 1. 36(10):e1233-8. [Medline]. Ouyang K, Wang D, Lu W, Xiong J, Xu J, Peng L, et al. Arthroscopic reduction and fixation of coronoid fractures with an exchange rod-a new technique. J Orthop Surg Res. 2017 Jan 18. 12 (1):9. [Medline]. [Full Text]. Moritomo H, Tada K, Yoshida T, Kawatsu N. Reconstruction of the coronoid for chronic dislocation of the elbow. Use of a graft from the olecranon in two cases. J Bone Joint Surg Br. 1998 May. 80(3):490-2. [Medline]. Gray AB, Alolabi B, Ferreira LM, Athwal GS, King GJ, Johnson JA. The effect of a coronoid prosthesis on restoring stability to the coronoid-deficient elbow: a biomechanical study. J Hand Surg Am. 2013 Sep. 38(9):1753-61. [Medline]. Type 2 coronoid fracture: unstable elbow fracture dislocation with fracture involving <50% of coronoid height and associated radial head fracture. Type 3 coronoid fracture: fracture involving >50% of coronoid height. Type 1 coronoid fracture: avulsion fracture at tip of coronoid. Status post open reduction and internal fixation of coronoid with plate-and-screw construct. Courtesy of Kenneth Egol, MD. Status post open reduction and suture fixation of coronoid, as evidenced by drill holes in proximal ulna. Sutures are used as a lasso to capture coronoid fragment, passed through ulnar drill holes, and tied over posterior ulna bony bridge. Patient is also status post radial head replacement for comminuted radial head fracture. This is an example of typical operative management of "terrible triad" elbow injuries. Second example of plate-and-screw constructs for fixation of type 3 coronoid fracture. Courtesy of Kenneth Egol, MD. Chronic elbow fracture dislocation presentation films with type II coronoid fracture (left) and fixation films (right). Fixation consisted of radial head replacement and suture lasso fixation of coronoid fracture. Since the elbow remained unstable throughout the range of motion, a hinged external fixator was placed. Disclosure: Serve(d) as a director, officer, partner, employee, advisor, consultant or trustee for: Orthopedic Trauma Association Board of directors.<br/>Received honoraria from Stryker for speaking and teaching; Received honoraria from Zimmer for speaking and teaching; for: Stryker; Zimmer. Disclosure: Received grant/research funds from Tornier for other; Received honoraria from Tornier for speaking and teaching.